The screen used to edit the data in MVO mode.The displayed data is that corresponding to the DATA mode inputs in Sample 1, but the data have been designated as Single period, and the user is free to modify the inputs in accordance with his/her opinions about the upcoming period. The currently selected asset is "S&P 500" and the Cor column displays the column of the correlation matrix corresponding to that asset. The screen is designed to accommodate up to 20 assets without the need for scrolling. 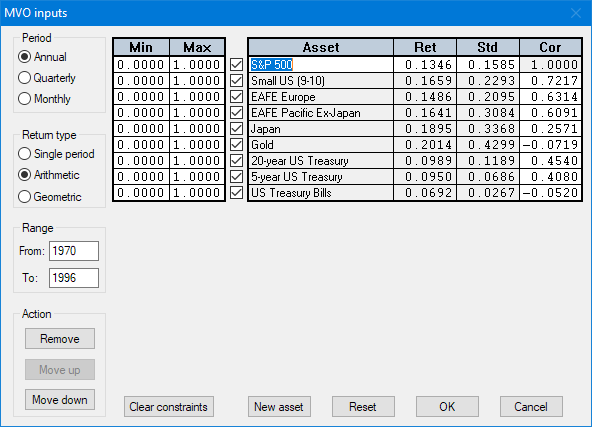 Upper and lower bounds on the allocation of each asset may be selected in the table on the left, and any asset may be excluded from the optimization by removing the check mark between the two tables.